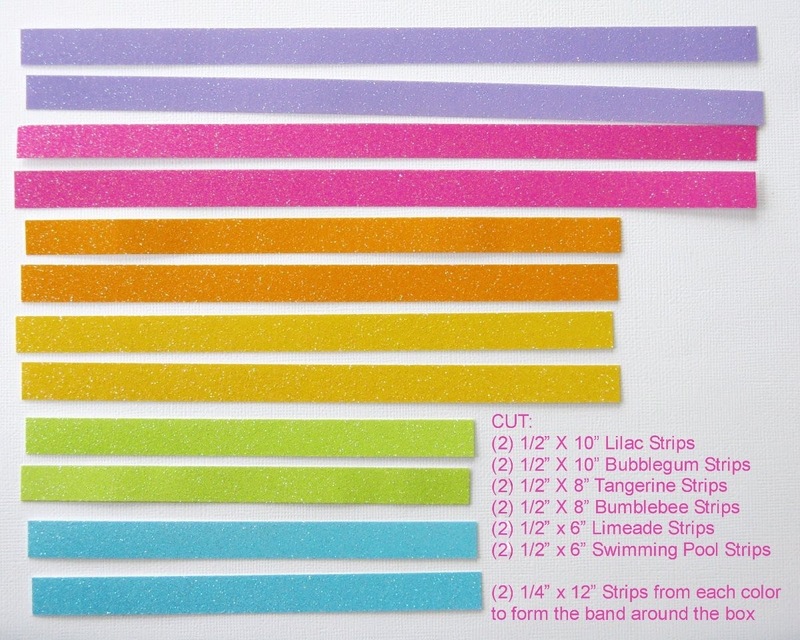 Step 1: Cut Doodlebug's Sugar Coated Cardstock into 1/2" and 1/4" strips as indicated in photo. 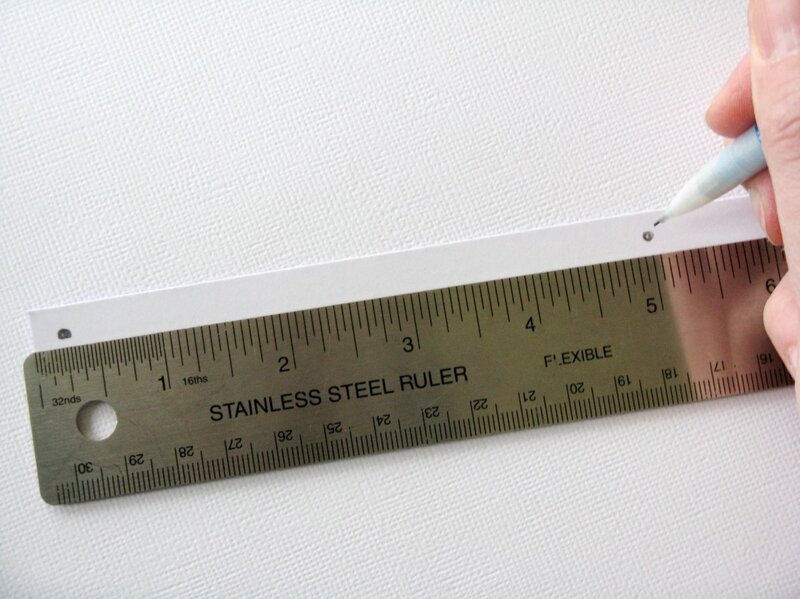 Step 2: Mark the back of each strip with three dots, 1/4" from each end and again at the middle mark. 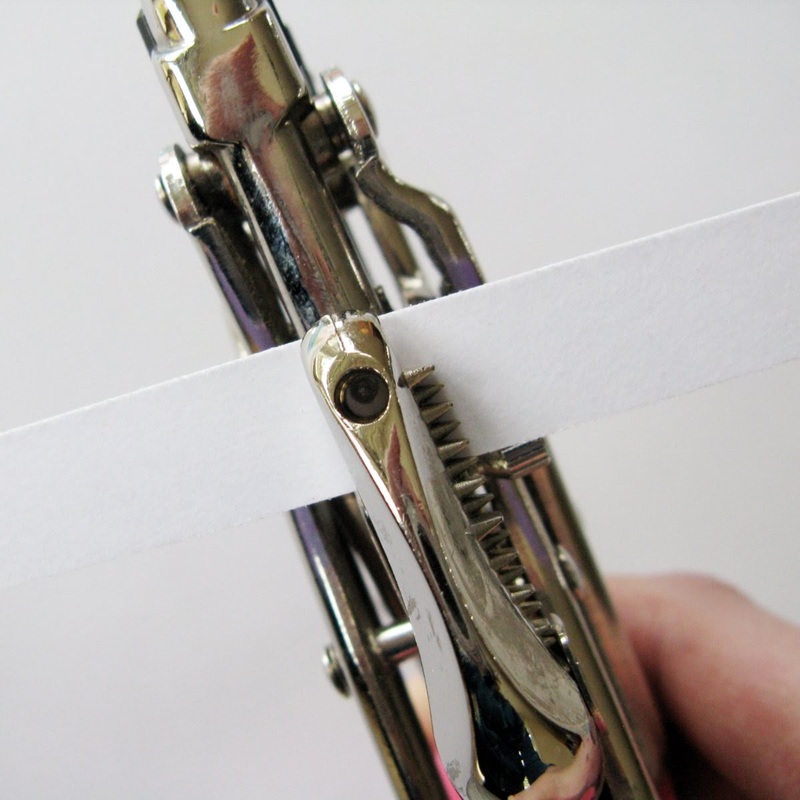 Step 3: Using a 1/8" hole punch or a paper piercer, punch out holes at the spots where you marked with your pencil. Step 4: Using the longest brad you can find, layer the longest cardstock strips onto it, starting with the center hole and then folding in each end. Your brad doesn't have to be pretty or match in color since you will be covering it later so I used ones from office supply. Step 5: Continue layering the strips. 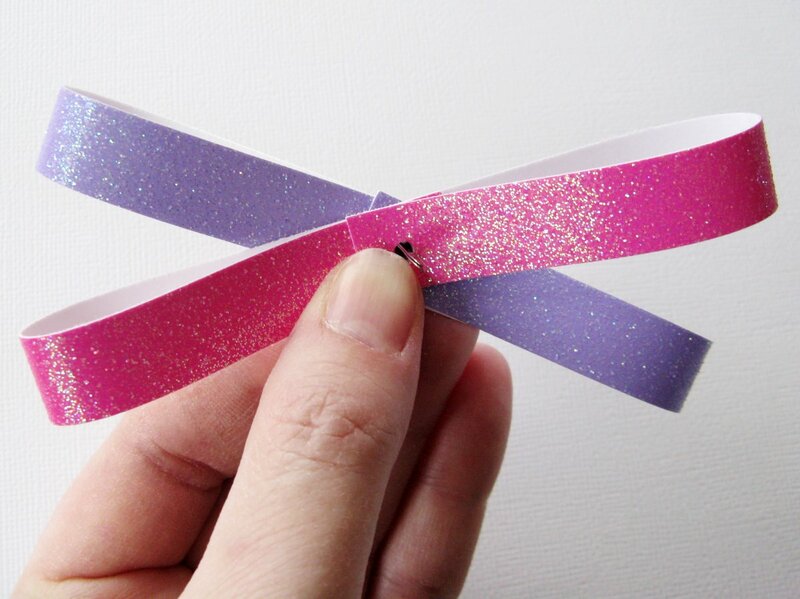 I chose to layer my colors so the pinks formed an "X" and then the lilac strips formed an "X", etc. and then I offset the other colors as I worked. Continue layering until you have run out of room on your brad and then close. Start a second brad with the smaller strips until all strips have been used. At this point I chose to pound my brads with a hammer to make the heads as flat as possible, but this is optional. 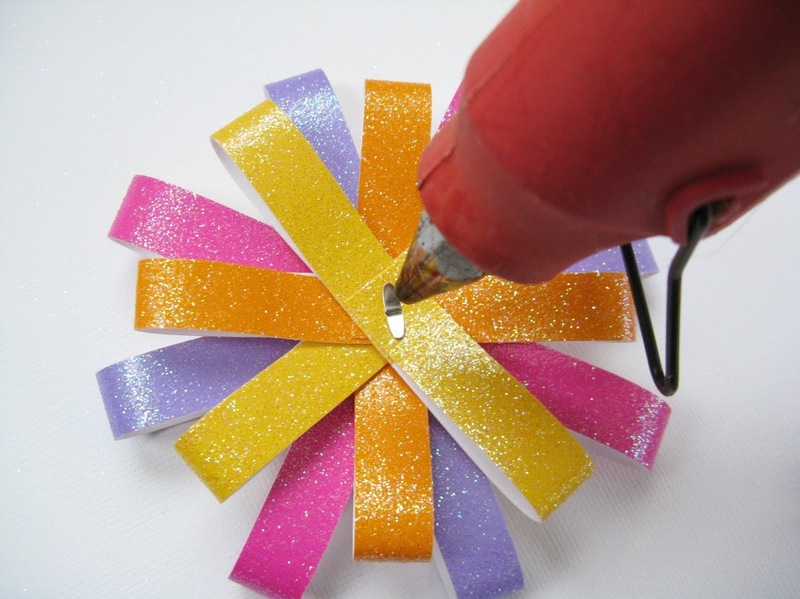 Step 6: With a hot glue gun pile a generous amount of glue in the center of the bow and adhere the two sets of strips together. 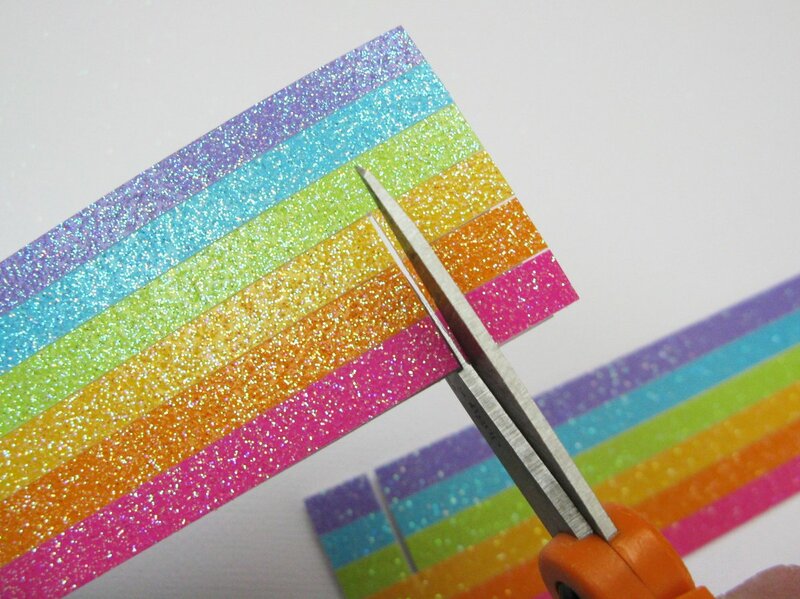 You can also try using glue dots, but I found that the hot glue had the quickest and strongest hold with the glittered surface of the sugar coated cardstock. 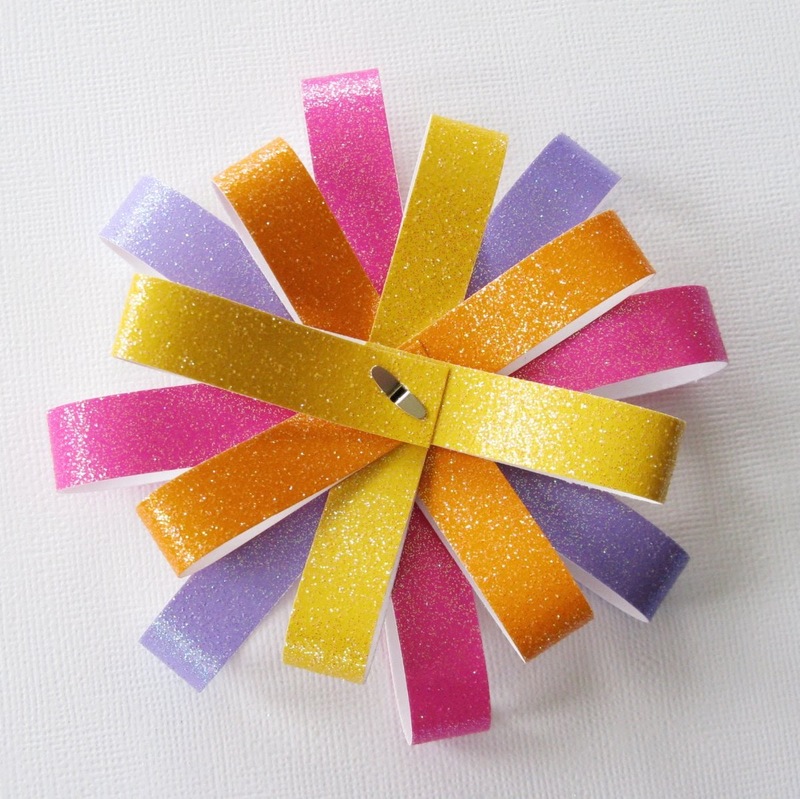 Step 7: Thread a button with Doodle twine and adhere to the top of the bow with another dab of hot glue. Step 8: Cut (2) 1-1/2" x 12" strips of scratch paper. I used lightweight white cardstock that was sort of bent up and not suitable for being seen in my scrapbooks. 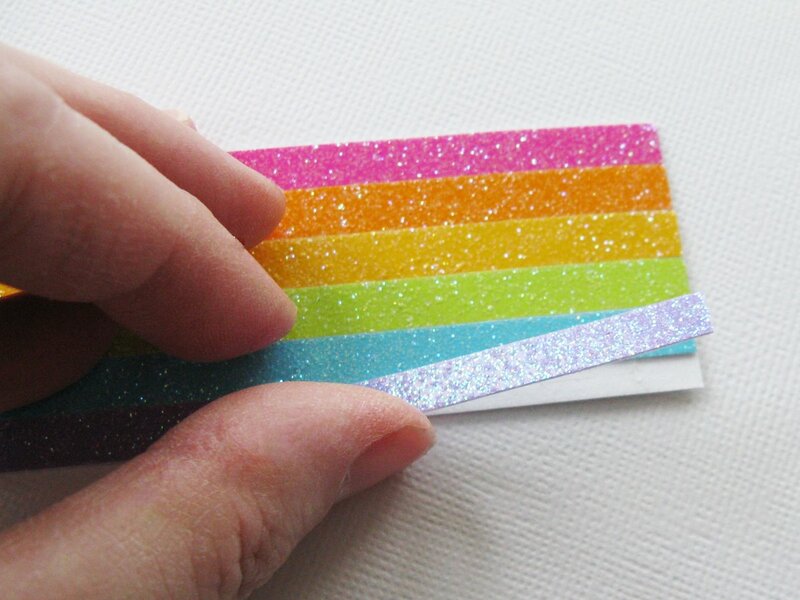 Cover each strip with adhesive of choice. 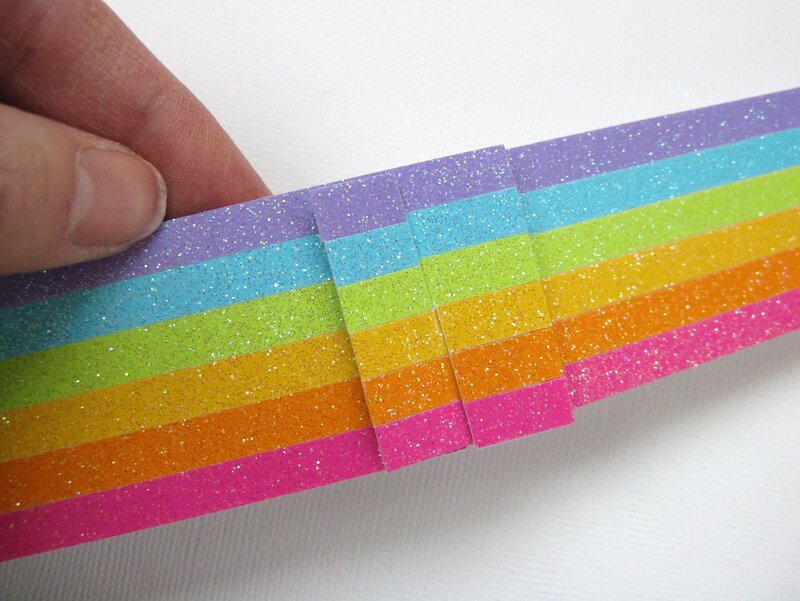 Step 9: Layer the 1/4" wide strips of Sugar Coated cardstock onto the sticky surface. Step 10: Lining up the two pieces so that the stripes match, cut notches on opposing sides that go just past the middle mark, approximately 1/2" from the end. Step 11: Slide the two pieces together. I used this to form my band for the bottom of the box. It is now ready to use on the box of your choice. After I selected my box, I positioned this portion on the bottom and then scored it to fit around my box. My box was small enough that I was able to cut a couple inches off each end on the top (to use for my tag) and then I connected the bands together at the top with more hot glue and my bow to hide the seam. 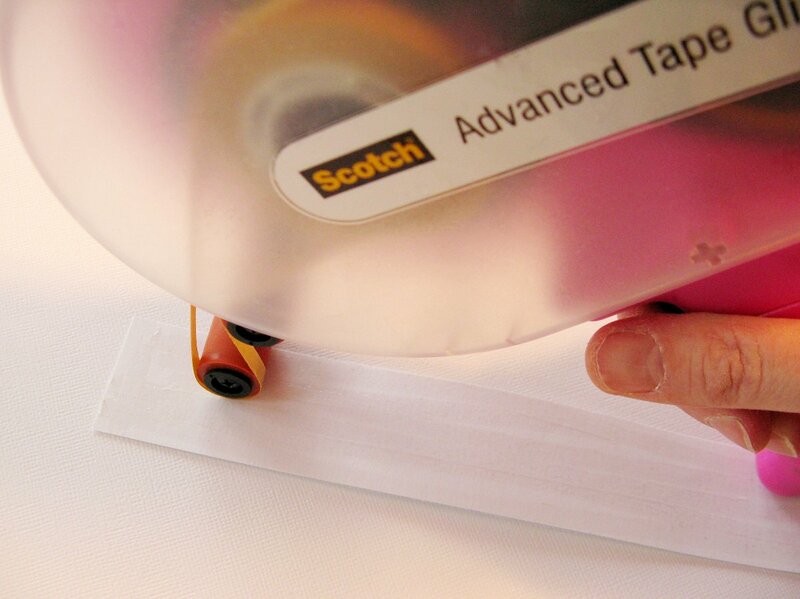 By doing this the band is easy to slide on and off and the box can easily be reused. It also solved my problem of not having a 20" long piece of paper to go around my box. 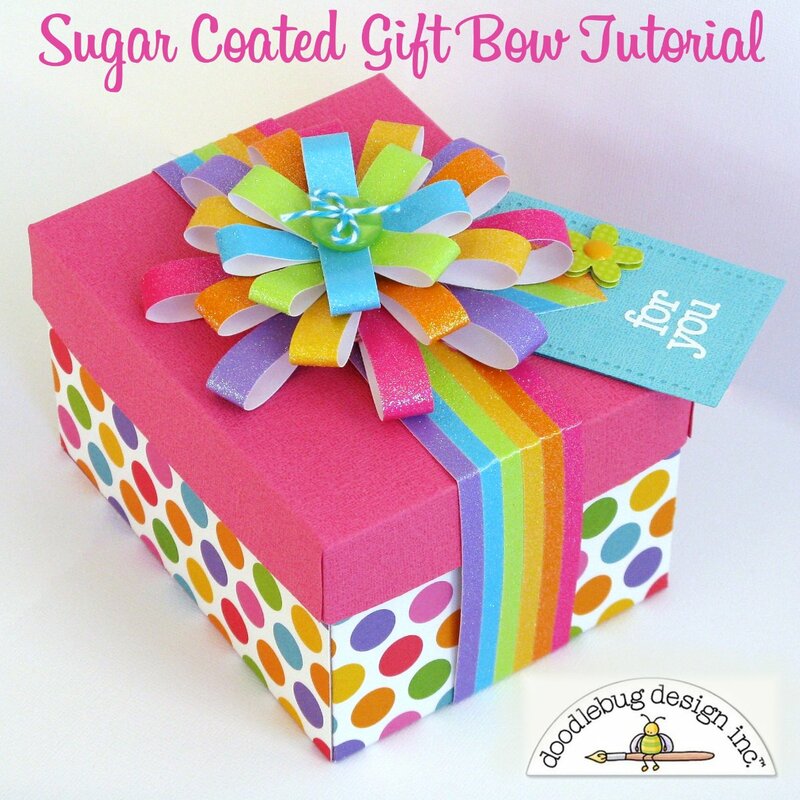 Step 12: Cut a box from fun, festive papers and have fun decorating! I used Doodlebug cardstock and patterned paper from the Fruit Stand collection and decorated a diecut tag with a heart cut from the leftovers along with a bitty blossom doodlepop and a doodles cardstock sticker sentiment. For my box I used THIS cutting file and cut my box twice (once from thin chipboard and again from the paper using a .01" offset) to make it extra sturdy. If you don't have access to a digital diecutting machine you can cover any small box you have on hand with paper or make one using a scoring tool. As quick as the first bow was to make, my second one came together even faster because all my supplies were already out and ready to go. I can see this looking cute in all sorts of papers and color schemes! 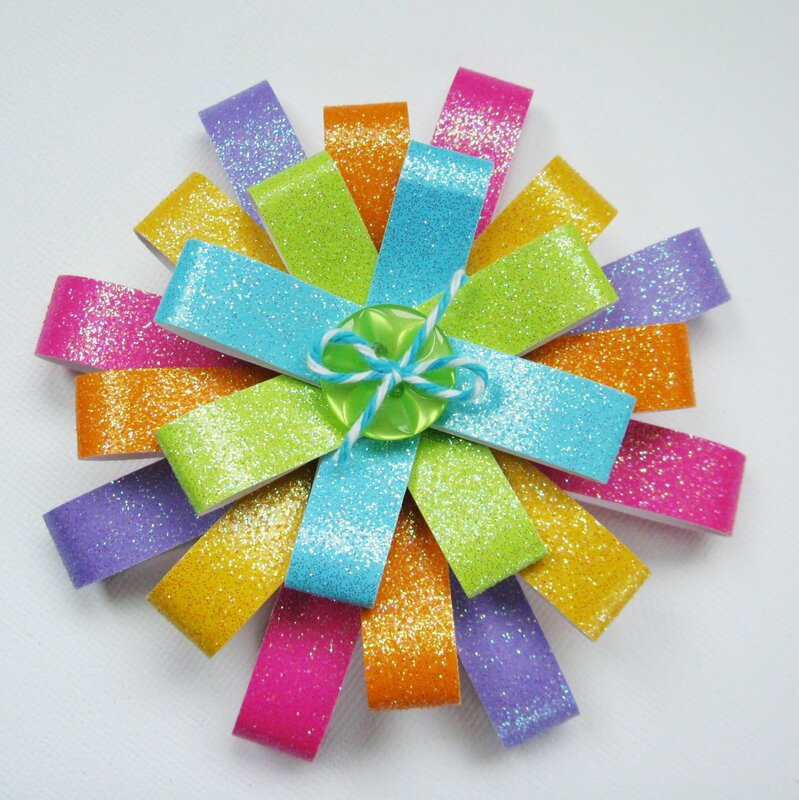 I hope I've inspired you to give this fun bow a try! Howwwwwwwww does Doodlebug Designs get cuter and cuter and cuter everrrrry time I see you guys.. how.. thats' what I wanna know..
Sooooooooooooo stinkin' K~UTE!!! L.r. Smith on fb!!! Love such detailed instructions! Pinned! This is too adorable! 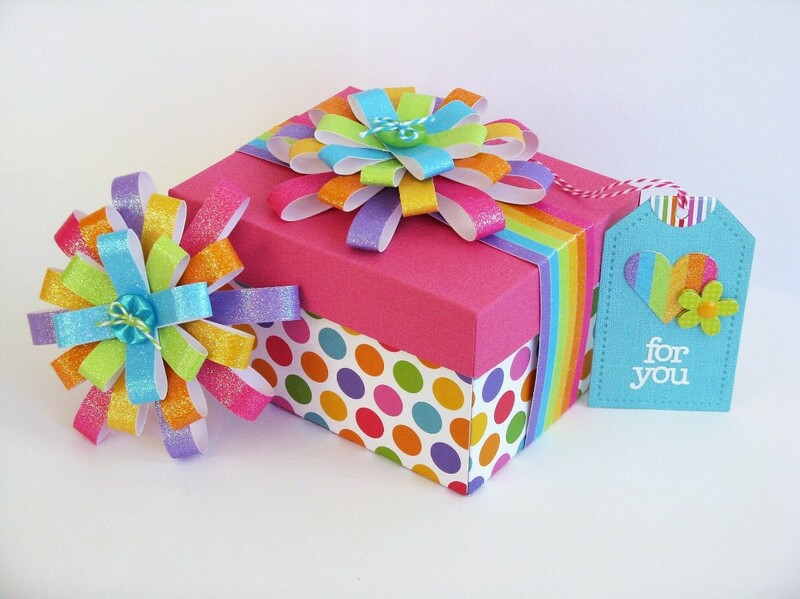 What a fantastic idea... the bright colors and creativity are bound to put a smile on any gift recipient's face.